The lats are the large 'side' muscles that make a man triangle-shaped. 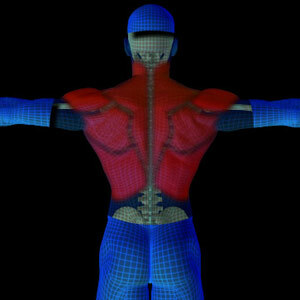 The lats are the large 'side' muscles that make a man triangle-shaped. To demonstrate how they are used during squeezing a tennis ball, try it! You'll quickly feel a tensing of the muscles on the side of the arm you use. It's especially noticeable if you have back pain. Any sport will require strong back muscles, for speed and coordination, for balance and movement and for providing a strong 'pillar' for all the limbs to move off of. Here are some simple exercises to help stretch and strengthen those all-important back muscles. Most of them are better performed on a firm, but not hard surface. While you work the muscles, you don't want to cause undue, painful pressure on bony parts of the body. Lie on your back and clasp your hands behind one thigh. Pull slowly toward the chest, keeping the other leg flat on the ground. Vary the action by flexing the ankle - first pointing the toe, then pulling it back toward the knee - at the same time as you stretch the leg. Hold each position for 5 seconds, then switch legs and repeat. Do 10 reps. Lie back, knees raised and together, feet flat on the floor. With your arms extended and near the body, and your palms flat on the floor, lift the feet off the ground slightly and rotate your trunk by moving the knee. Move the knees slightly left, then right. Over time, as you become more flexible and build strength, you can increase the range of motion. Ultimately, you should be able to touch your knee to the floor. Alternate the action by crossing your arms over your chest, then repeat. Lie down on your back, knees raised and feet flat on the floor. Push the small of the back into the floor, feel the tension in the lower abdominals. Vary the action by moving your feet together and performing the exercise, then slightly apart and repeat. As you press into the ground, hold for 5 seconds, but continue to breath slowly and normally. Lie on your back, knees raised and feet flat on the ground, arms crossed over your chest. Keeping the legs and knees together, raise the buttocks up slightly and hold for 5 seconds. Lower slowly, count to two, then repeat. Remember to breathe normally through the exercise, in and out slowly. Switch legs and repeat. Vary the exercise by extending the leg with toe pointed, then flex the ankle perpendicular to the leg. Hold for 2 seconds and repeat. Do 10 reps for each leg. Never perform these exercises if they produce back pain. Mild discomfort from inactivity is natural. Pain is a signal that something is wrong. Consult your physician.